Over the past few weeks, I’ve traveled a great deal through towns and cities that are all a part of the Camino de Santiago (reflections on those places coming soon). For those readers that don’t know, the Camino de Santiago de Compostela (literally the “walk of St. James’ of Compostela”) is a pilgrimage route, the most well-known of which runs through the French Pyrenes through the north of Spain to the Cathedral of Santiago de Compostela on the northwestern point of Galicia (see this map for an idea). This pilgrimage is not only famous among the religious, as the ruins of Santiago (aka St. James) were supposedly found in this Galician capital, but also for tons of tourists as well, who to northern Spain to traverse the famous path, hoping on their way to find inner-peace or just enjoy the novelty of the trip. In fact, this pilgrimage has become one of the most well-known of the many fabulous Spanish traditions – up there with the running of the bulls in Pamplona, Buñol’s Tomatina, and Sevilla’s Semana Santa. Interestingly enough, the city of Santiago de Compostela also boasts a famous, similarly-named dessert called the Tarta de Santiago (“St. James’ cake). Popularized through its omnipresence in the bakeries along the Camino de Santiago, this delectable cake is also found all over Spain as a simple but oh-so-delicious merienda with afternoon coffee or breakfast. 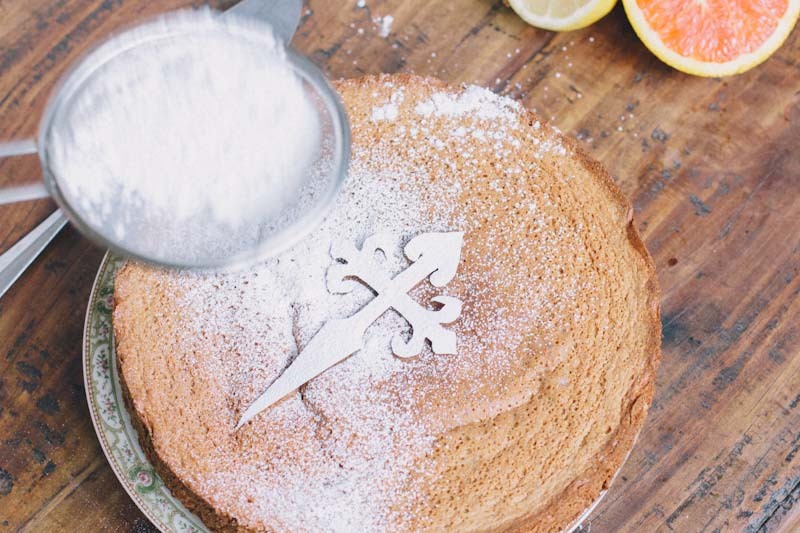 Made of a mix of ground almonds, a cloud of meringue, sugar, and citrus zest, this cake has become emblematic of the Camino – and yet it also lays claim to a secret Jewish past that very few who eat it know. Without interruption for a thousand seventy years. …That is why I weep and beat my hands, lament forever on my lips. 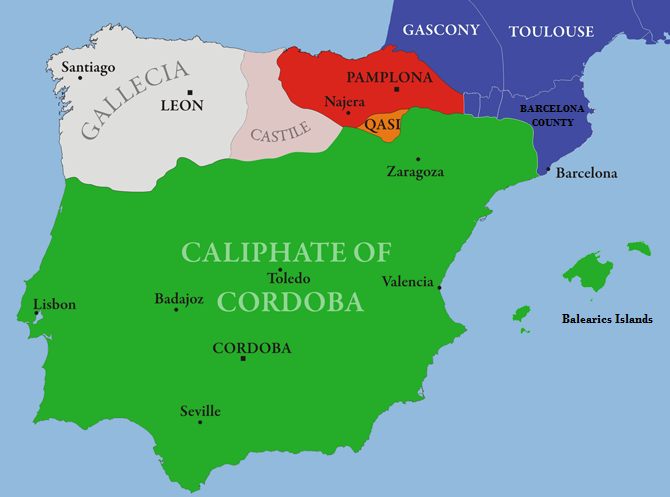 Fleeing to the north of Spain, the Sephardim not only brought their intellectual and economic acumen to their new northern Christian courts, but also their recipes and traditional dishes. And not just any food: according to Claudia Roden, one of my favorite food historians, the Sephardim fleeing Almohad persecution brought their sweets with them. One in particular, a Passover cake made of ground almonds, eggs, sugar, and citrus, made its way all the way to northern Galicia. Sounds familiar right? As Devra Ferst writes: “The widely available tarta de Santiago de Compostela, an almond cake that is made with orange-and-lemon zest and named for a cathedral to which pilgrims travel, was originally a Passover dish from Andalusia in the South” (Ferst, from here). Even though they were forced to relocate across the country, the cake remained a favorite of Andalusian Sephardim. After waves of forced conversions, it transcended its role as a dessert for Passover – as it has no leavening, it fits the halakhic stipulations for the observance of the holiday – later becoming a staple of judeoconversos. It seems that though they changed religion, these Jewish converts to Christianity didn’t see anything wrong with continuing to make the delicious cake, and evidently their tastes didn’t also change with their religion. Who would have thought that a cake named for a Christian saint and his pilgrimage really was a Passover dessert? An even more fascinating addendum to this history is that the tarta de Santiago was chosen to represent Spain in the 2006 Café Europa initiative of the European Union. Seems like an ironic, though in this historian’s eyes, an oh-so-fitting selection. But whether you’re fleeing Almohad persecution or making a Christian pilgrimage, everyone, regardless of religious affiliation, can agree this cake is definitely delicious. This recipe is adapted from Claudia Roden’s brilliant cookbook The Book of Spanish Food. While this cake can come together in moments with the use of an electric mixer, I opted (read: was forced) to go the medieval route and hand-whip the egg whites into meringue. If you’re up for the arm workout, I recommend it. As Roden explains, and in my experience, this cake sometimes comes with a pastry base or served, as in Navarre, with a thin layer of jam on top. Personally, I like to keep it simple with a generous amount of orange zest in the batter and quick final dusting of confectioner’s sugar (without the customary cross of St. James though). However, if you feel like experimenting, the cake takes phenomenally well to other types of citrus (did someone say lime?!) or other flavorings, like cinnamon or vanilla. Let your imagination run free! Preheat the oven to 350°F/160°C. Finely grind the almonds into a flour-like texture in a food processor. With an electric mixer (or by hand), beat the egg yolks with the sugar into a smooth pale yellow cream. Beat in the zest and extract and any other flavorings you want to add. Add the ground almonds and mix well. (The batter will be a little stiff but don’t worry). With clean beaters (or a clean whisk), beat the egg whites in a large bowl until stiff peaks form. Fold the egg whites into the egg and almond mixture – this will take a while because the egg and almond mixture is so thick, but keep at it until the egg whites are thoroughly incorporated. Grease an 11-inch springform pan with butter and dust it with flour. Pour the batter into the pan and bake for 40 minutes, or until it feels firm to the touch (Note: this depends on your oven – mine took almost an hour to become fully firm and even then it was just on the edge of underdone. If the top starts to brown too much, just slip a piece of aluminum foil on top, without sealing the pan, of it to protect it). Let the cake cool completely before turning out. Once cool, dust with a cloud of confectioners’ sugar and, if you’d like, for a traditional effect, cut out a cross of St. James before (see here) and then dust with the sugar. Or, for a Navarre-inspired version, forego the sugar and spread a thin layer of apricot jam on top of the cake. Enjoy! The cold has come to Madrid. Late autumn, or more precisely, winter has settled in here in La Ciudad Real. And I have to be honest, I’m not loving it (warm weather is much more my shtick). At the same time, being from the Northeast of the United States, where there are always four full seasons, I feel very deeply connected to the changing of the seasons and the different celebrations, phases of life, and –of course!– foods that those transitions bring. With that in mind, I have a post for you all today about Sukkot, one of the holidays in the Jewish calendar that marks the end of a season and the transition into another. Particularly, I want to tell you about a food that represents the multiple meanings of this holiday: biscochikos. Biscochikos are small, twisted cookie rings. Much like Italian biscotti, they are often twice-baked, resulting in a crumbly, pleasantly crunchy cookie. The history of this cookie goes back to medieval Iberia, their country of origin and where they first were incorporated into the Sephardic culinary repertoire. In medieval Andalusia, the Sephardim combined the Islamic zeal and preparation techniques for desserts, or repostería, as is said in Spanish, with their own unique tastes and religious observances to create the biscochiko. Gil Marks explains in the Encyclopedia of Jewish Food, that “early Sephardim rarely baked with butter” as it was a food associated with the Christian Spanish community “and cookies instead contained oil” combined with other pareve (kosher) ingredients such as flour, sugar, and eggs, “creating a dough that’s easy to shape and a tender cookie.” The use of oil in the cookie dough is a distinctly Sephardic element of the dessert, as it resulted in a cookie that could be eaten with any meal, milk or meat, without transgressing on the laws of kashrut. Most Sephardic desserts, even to this day, are characterized by the use of oil in place of butter as the recipe’s main fat. After the expulsion in 1492, the Sephardim took their biscochikos with them to their various new homes, where they began to add new ingredients native to those adopted communities to flavor and decorate the otherwise pretty plain ring cookies. For instance, Sephardic communities in Greece perfume their biscochikos with cinnamon and coat them in sesame seeds while Turkish Sephardic communities add walnuts and orange blossom water. Depending on where you are in the world, these cookies can be called biscochikos de huevo or guevo, biscotios, vizcochikos, roskitas, or kaak. In that way, the physically represent the journey of Sephardic cooking and communities in diaspora. Despite the multiple names for this same cookie, they are a staple in Sephardic diasporic communities for both festive and every day meals, as common on the Shabbat desayuno table as on Rosh Hashanah dessert plates. Sukkot, the Jewish holiday celebrating the final major autumn harvest and the 40-year passage of the Israelites through the desert, is no exception. As Gil Marks shows, they can even factor into the decoration of the traditional sukkah, as “on sukkot, some families hang biscochos from the branches of the sukkah.” Sukkot comes two weeks after Rosh Hashanah, the Jewish New Year, and is celebrated for a week, in which Jews all over the world erect sukkot (tents) and live in them for the duration of the holiday. It’s a holiday celebrating bounty – corresponding with the year’s last burst of agricultural abundance – and the consolidation of Jewish identity – as the period of wandering in the desert is reenacted by the dwelling in the sukkah. Interestingly, food is central to the “proper” celebration of Sukkot. Even in the building of the sukkah, rabbinic commentators argued in the Mishnah about the proper size of a sukkah, finally settling on a structure that “measure[s] at least 7 x 7 handbreadths to contain the head, major part of the body, and the table of the occupant: 6 x 6 handbreadths for himself, and 1 x 1 for the table.” Pretty notable that the main structure that symbolizes the holiday is required to make room for a table on which the sukkah’s occupants can eat. This is because, as the rabbis continue to explain, to fulfill the requirement to dwell in the sukkah, its occupant must eat at least two meals a day. In the logic of the rabbis, it’s not considered really dwelling in the sukkah unless you’re eating in it. Living and eating are considered so intimately linked in Jewish tradition that the proper celebration of a holiday depends on it. Cool, right? And if you’re still not convinced, check out this recipe from Directo al Paladar, or this one from Dulces Frivolidades. The recipe for rosquillas tontas and biscochikos are pretty darn similar. Coincidence? I like to think not. But whatever way you make them, and by whatever name you call them, they’re exactly the treat to celebrate life’s bounty, whether for Sukkot or San Isidro’s Feast. I hope you enjoy them! To evoke the agricultural bounty of Sukkot, when it is customary to eat dishes that center on vegetables and fruits, I decided to pair these biscochikos with a fruit compote of plums and pears accentuated with a bit of orange zest and juice. The slightly acidic compote makes a great accompaniment for the subtlety sweet cookies. What’s more, both recipes make an abundance of sweet treats, which makes them ideal to serve to guests in a sukkah. Feel free to customize both the biscochikos and compote to your tastes – whether that’s more or less orange zest, the addition of spices like clove or anise, or a pre-oven sprinkling of almonds or any other nut or seed… And if you want a little bit of everything, this recipe makes enough to customize each cookie as you see fit! Preheat your oven to 350°F/180°C. Position a rack in the idle of the oven. Lightly grease a 9” x 13” baking sheet or cover it with a sheet of aluminum foil. In a medium bowl, sift together the flour, salt, and baking powder. In another lightly beat the eggs, then add the sugar, oil, cinnamon, and/or any other flavoring you’d like to add (anise, orange zest, and vanilla are all great options). Add the dry ingredients to the wet mixture and mix until a soft dough forms (once all the flour is mixed in, you’re there). Lightly dust your work surface with flour. Dump dough out onto the counter. Divide it into 4 equal pieces. Take one of the four pieces and divide it in half. Take that eighth of the dough and divide it into 3 even balls of dough. To form basic cookie rings, take one of those 3 dough balls and roll it into a log approximately 10 to 12 inches in length, depending on how thin you want the rings to be. Cut the log in half on a diagonal. Take one of the rolled halves and bring the ends together. Squeeze them to form a closed ring. Place on the prepared baking sheet. To form twists, follow the same technique as with the basic ring, except before bringing the ends of the log together, roll out one the halves into a log approximately twice the length of the log for a regular ring. Take one end of the dough and bring it next to the other. Pick up the folded end of the dough and begin gently winding the halves around each other (my advice: do this slowly and coat the log in a little extra flour because the dough is very fragile). Once the twist is made, bring the ends together as you would for a normal ring and squeeze them to close the twisted ring. Place on the baking sheet. Once you have your completed rings on the baking sheet (I was able to fit 16 on mine, which meant 3 separate rounds of baking, but of course you can do multiple pans at a time), brush the rings with the egg and water mixture. From here, let your imagination go wild: leave them as is, top with walnuts or sesame seeds, or dust them with raw sugar. Bake the rings for 20 minutes or until golden brown. Leave on a rack to cool completely. If you like your cookies crispier, turn off the oven and place all the baked cookies in it until it cools completely. This will act almost as a second baking, which will leave the cookies with a texture closer to a biscotti and much browner appearance. Cut the plums into 8 slices and chunk the pears in ½-inch pieces. Place cut fruit in a medium saucepan with the orange juice, zest, sugar, water, and salt. Mix to combine. Bring mixture to a boil then turn it down to a simmer. Let the mixture cook, covered, for about 20-30 minutes, stirring occasionally, until the fruit begins to break down and the cooking liquid reduces and thickens. Don’t overcook the mixture: the fruit should still hold its shape. Serve with biscochikos and enjoy! A little over a month ago, I finished the fabulous book The Lady in Gold by Anne Marie O’Connor. O’Connor tells the true story behind the painting of Adele Block-Bauer by Gustav Klimt – his famous golden portrait, named Portrait of Adele Bloch Bauer I, which now hangs in the Neue Galerie in New York – and its restitution to the Bloch-Bauer family. The book follows the timeline from the end of the nineteenth century, when Gustav Klimt and his fellow Secessionist painters were making a great splash in Vienna’s high society, through the horrors of World War II, into the post-Holocaust fate of the gilded painting of Adele. The entire book was enthralling, mostly due to Ms. O’Connor’s attention to every last sumptuous historical detail that makes the history come alive. One detail, in particular, caught my eye more than any other: the description of Gustav Klimt’s luxurious breakfast: “every morning Klimt downed strong coffee and enormous breakfast. ‘Whipped cream played a major role,’ along with Gugelhopf, a rich cake of rum, raisins, and cherries in the shape of a Turkish turban, recalled the painter Carl Moll, who sat at the open-air table with Klimt and their fellow artists, plotting the future of Austrian art” (p. 7). Definitely a breakfast worthy of a great artist. Not only does this description sound so good (rum, raisins, cherries, whipped cream – need I say more?) but it also struck me that O’Connor’s re-telling of this history should include such a singular gastronomic detail. Her mention of Klimt’s breakfast, though, works to highlight the ways that beautiful rich foods like gugelhopf were as symbolic of their time as were Vienna’s groundbreaking artists. Luxurious, over-the-top dishes like gugelhopf, eaten as they were for the first meal of the day, reflect exactly the values of wealth that were important not only to fashionable, rebellious artists like Klimt, but also to the social class of late 19th century Vienna that patronized them. As O’Connor explains, that social class was none other than the Jewish bourgeoisie; and this enlightened Viennese Jewish upper middle class often sat alongside artists like Klimt enjoying the rich, fruit-studded gugelhopf. The cake itself symbolizes the social mores, hierarchies, and tastes of the time – which, as O’Connor demonstrates in the book, were mostly being dictated by the wealthy Viennese Jewish nouveau riche. Okay, you say, we get it – gugelhopf symbolizes late 19th century Viennese society. But what does this bourgeois gugelhopf have to do with the homely babka? As shown by the abundance of those chocolate-swirled rectangular chocolate breakfast loaves popularized by food purveyors like Zabar’s, the United States Jewish community has always had a love affair with the yeasty pastry known as babka, so there's the jewish connection. On further digging, however, it turns out that gugelhopf is simply the Austrian version of the beloved babka. This article from Tania Ralli in the Chicago Tribune sums it up perfectly: “whether you call it kugelhopf, kougelhopf, gugelhopf, kouglof or any of the other names this shapely cake goes by across Central Europe, it is the same slightly sweet, light, yeast bread”; to riff on Shakespeare: babka by any other name would taste as sweet, whether that name begins with a k or a g.
It also turns out that both babka and gugelhopf – whichever name you choose to call this delicious breakfast pastry – share a tendency towards the aesthetic. While, as Gil Marks explains, the “venerable non-Jewish version [of babka], baked in a ‘Turk’s head pan’ (a scalloped-edged tube pan that resembles a turban) is similar in texture (spongy) and shape (tall and cylindrical) to an Alsation kugelhopf” the name of gugelhopf’s more homely, Polish sister, babka “literally meaning ‘grandma’s cake’…was derived because cake’s tall, fluted sides, formed in a traditional Polish pan, were reminiscent of an old woman’s skirt, and/or because grandmother’s were the primary bakers of this treat” (p. 32). Here we can see that even the creation and names of these pastries prioritize a certain look – in particular one that’s symbolic of the time and place they come from: for gugelhopf, that place is the elite cafes of imperial Vienna, and for babka, it’s the kitchens of Polish-Jewish grandmothers. In that way, though these two yeasted breads share a great deal in common, especially their connection to the jewish community, it becomes clear that each pastry also represents the two very different realities of these contemporaneous Jewish communities. In that way, both the babka and the gugelhopf visually represent the realities the Jewish communities that prepared them: the homely, comforting babka demonstrating the struggle of lower-class Polish Jews in the harsh shtetl while with the stately gugelhopf, towering with whipped cream, reinforces the comfort and pleasures of the assimilated, bourgeois Viennese Jews. Each are a lesson in how the food we eat, even through its appearance, can reveal who we are and how we live, even as we consider ourselves part of a single community. So, I thought it would only be a fitting tribute to the multiple meanings of sweetened, yeasted breads and its Klimt connection to whip up my take on the babka, one that both the techniques and aesthetic tendencies of babka and gugelhopf in two yeasted loaves, swirled with apricot filling and studded with streusel. I like to think of it as a golden tribute to the golden lady – as well as to the different experiences of Jewish communities around Eastern Europe at the time. And it’s perhaps an even more delicious tribute if eaten with a strong cup of Viennese coffee while staring at the golden lady herself. The recipe for this babka uses the dough from Yotam Ottolenghi's fabulous chocolate krantz cake recipe (improved upon and put into US measurements here by Deb Perelman from Smitten Kitchen) and the filing from this great Apricot Almond Linzer Torte from Gourmet magazine a few years back. The introduction to the linzer torte recipe, funnily enough, also mentions Vienna as the recipe's inspiration. And as Deb Perelman sums up so well in her blog post on the cakes: it's always kind of a mess. But don't worry, even though these loaves look a little shaggy, they always come out delicious. And they are certainly worth the effort, even though they are a multi-day affair (to let the dough rise long enough). My word of advice: make sure to use the dough attachment on a stand mixer in order to mix the dough for the full 10 minutes it needs; this is not a recipe to rush, because then the babkas will lose out on height and airiness. They're great for breakfast and even better around 4 pm with coffee. For the dough: Combine the flour, sugar, yeast and zest in the bottom of the bowl of a stand mixer. Add eggs and 1/2 cup water, mixing with the dough hook until it comes together; this may take a couple minutes. It’s okay if it’s on the dry side, but if it doesn’t come together at all, add extra water, 1 tablespoon at a time, until the dough forms a mass. With the mixer on low, add the salt, then the butter, a spoonful at a time, mixing until it’s incorporated into the dough. Then, mix on medium speed for 10 minutes until dough is completely smooth; you’ll need to scrape the bowl down a few times. I usually found that after 10 minutes, the dough began to pull away from the sides of the bowl. If it doesn’t, you can add 1 tablespoon extra flour to help this along. Coat a large bowl with oil (or scrape the dough out onto a counter and oil this one) and place dough inside, cover with plastic and refrigerate. Leave in fridge for at least half a day, preferably overnight. For the filling: Simmer water, sugar, brandy, and apricots in a small saucepan, uncovered, stirring occasionally, until apricots are tender and liquid is syrupy, 15 to 20 minutes. Transfer mixture to cleaned food processor and pulse until almost smooth. Spread mixture onto a plate and chill until 15 minutes before you're ready to use it. For the streusel: Mix sugars, flour, and salt in a bowl with a mixer on low speed. Once combined, add the butter and mix on medium speed until the mixture forms pea-sized clumps. Assembling the loaves: Coat two 9-by-4-inch (2 1/4 or 1kg) loaf pans with oil or butter, and line the bottom of each with a rectangle of parchment paper. Take half of dough from fridge (leave the other half chilled). Roll out on a well-floured counter to about a 10-inch width (the side closest to you) and as long in length (away from you) as you can when rolling it thin, likely 10 to 12 inches. Spread half of apricot mixture evenly over the dough, leaving a 1/2-inch border all around. Brush the end farthest away from you with water. Roll the dough up with the filling into a long, tight cigar. Seal the dampened end onto the log. Sprinkle filling with 1/8 cup of sugar, if you'd like. Repeat with second dough. Trim last 1/2-inch off each end of log. Gently cut the log in half lengthwise and lay them next to each other on the counter, cut sides up. Pinch the top ends gently together. Lift one side over the next, forming a twist and trying to keep the cut sides facing out. It will look messy but don't worry - after the loaves rise they will look fine. Cover with a damp tea towel and leave to rise another 1 to 1 1/2 hours at room temperature. Repeat process with second loaf. Heat oven to 375°F (190°C). Remove towels. Sprinkle place each loaf with half of the streusel mixture and place them on the middle rack of your oven. Bake for 30 minutes. A skewer inserted into an underbaked babka will feel stretchy/rubbery inside and may come back with dough on it. When fully baked, you’ll feel almost no resistance. If you babka needs more time, put it back, 5 minutes at a time then re-test. If it browns too quickly, you can cover it with foil. The streusel may cook a touch faster than the loaves as well, so don't be alarmed if you smell the streusel but the inside of the babka isn't fully cooked through: simply place a piece of tin foil on the loaves and let them bake for as long as they need. When they are done the streusel should be golden brown and if you tap the bottom of the babka it should sound hollow. The babkas keep for several days at room temperature, or if you prefer, they freeze well and keep for about a month. Want to receive Boka Dulse updates straight to your inbox? Subscribe here! So happy to have you on the Boka Dulse elist - thanks! Want to learn about the food of the Jewish diaspora? Have me come teach at your synagogue today!